When you’re trying to find a set of tires that is good for most of the weather and road conditions that you will have to deal with, we understand the impulse to want an option that is pretty good most of the time. It is too easy to spend a ton of money buying new sets of tires in case you may come into contact with snow or heavy rain, and it is just as easy to assume that a set of all-season tires will be perfect for everything. In this entry, we want to talk about when all-season tires are right for your vehicle as well as the times that they might not be the best choice. At Elite Motor Sports in Woodland, we carry an unmatched selection of the most-trusted wheels and tires for trucks, SUVs, and cars. When you need a new set of tires or wheels, come by our shop. One of our friendly, knowledgeable staff members will happily show you the in-stock options, answer your questions, and help you find tires that will fit your vehicle and your needs. They can also discuss the auto repair and enhancements as well as any auto accessories that you are interested in. While we don’t have a lot of crazy weather in Woodland that would force you to buy a separate set of snow tires like people in other parts of the country have to do, it is a good idea to understand exactly what your tires are good for and what their shortcomings might be. The way in which tires handle weather and road conditions is based on several factors, including tread size and shape. Tread size and shape is important for several reasons. First, the design and placement of treads determines how the tire will stick to the road and how it will handle moisture. Slick tires, for example, will have a difficult time getting purchase if the road is wet. All-season tires, as well as snow tires and mud tires, have treads that are designed to direct and push water, ice, snow, and mud away from the driving surface in order to ensure a better, safer grip. While dedicated snow tires or mudding tires will give you the best grip in those conditions, they are not ideal for daily driving. They are usually softer, which means that they can wear out faster than all-season tires, and their more aggressive tread is less comfortable on the road. All-seasons were developed to bridge the gap between road tires and more aggressive off-roading and seasonal tires. As is the case with most things that try to do everything for everyone, all-season tires are not perfect. In extremely wet or snowy conditions, they just aren’t as effective as snow tires. If you are planning to take your car to the track, all-seasons might not be your best bet there, either. If you aren’t an extreme mudder or weekend racer, all-season tires are probably going to be everything that you need. Their strength lies in their balance of features that anticipate what most normal drivers will experience when they are on the road. When you need a new set of wheels and tires, come down to Elite Motor Sports in Woodland. We have a many different options at a range of prices that are sure to satisfy your needs and stay within your budget. 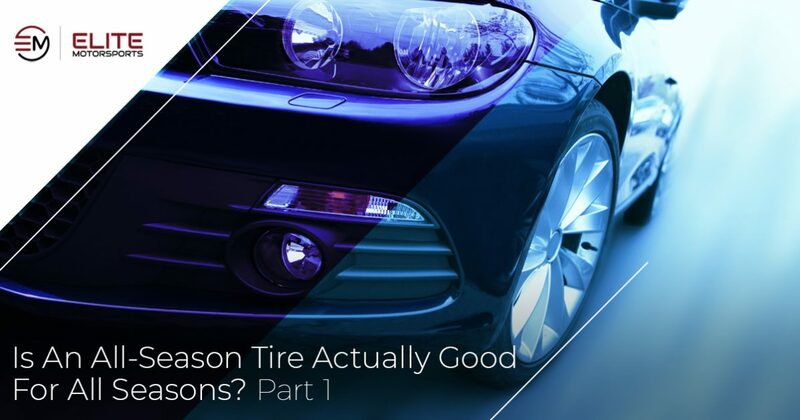 Contact us to learn more about why tires and wheels are so important, or check back soon for part two in this blog series where we will discuss what makes an all-season tire unique.